When you ask people about their great fears in life, virtually everyone talks about cancer,” says Mara G. Aspinall (MBA ’87), past president of Genzyme Genetics, a Westborough, Massachusetts-based division of the biotech giant Genzyme Corporation. The 1,500-person division is a leader in the emerging field of personalized medicine, which treats cancer and other diseases with customized therapies that take into account the patient’s specific genetic traits. With HBS professor Richard Hamermesh, Aspinall recently coauthored “Realizing the Promise of Personalized Medicine,” a Harvard Business Review article that outlines an agenda that could hasten the transition from “trial-and-error” therapies for life-threatening illnesses to a more targeted line of attack. Aspinall began her career at Bain & Company, working with health-care product and service companies, and later served as a director at the Boston law firm of Hale and Dorr, LLP, before joining Genzyme in 1997. 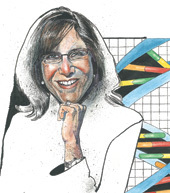 While at Hale and Dorr, she assumed leadership roles on the boards of the Dana-Farber Cancer Institute and the American Cancer Society, positions that involved extensive contact with “an incredibly dedicated and brilliant group of physicians, as well as patients with such courage and grace that I knew I wanted to do something to get more involved in their battle.” This year she is on a “working sabbatical” at Dana-Farber and Harvard Medical School, focusing on the implementation of personalized medicine into clinical practice. Why does it seem that science is often so far ahead of practice in the medical field? Science has moved especially quickly in the last five years with the completion of the Human Genome Project and the explosion of new diagnostic capabilities. In our medical system, however, new science has to clear a high hurdle before it has an impact on practice. This caution is sensible in some arenas, but personalized medicine results in safer and more effective therapy choices, not higher risk. Moving forward, we need to embrace the more precise information that personalized medicine brings. This is particularly important in fast-moving diseases, where the window for a positive outcome is small. What aspects of their business model do pharmaceutical companies need to redesign to hasten the availability of personalized medicine? In the past, pharmaceutical companies focused their R&D on treatments for common illnesses — such as diabetes and high cholesterol — an approach that resulted in the development of blockbuster drugs. We now recognize that diseases are far more complex and heterogenic than originally thought. For example, breast cancer is not just one disease but ten or fifteen different diseases, each requiring its own subset of treatments, as determined by both patient and tumor DNA. The future pharmaceutical business model needs to support the development of treatments for each of these targeted subsets of patients, with a much higher efficacy rate — 80 percent or more. Is 80 percent efficacy unusual for drugs currently on the market? Across all patients and diseases, drug efficacy averages 50 percent, so half the time they bring no clinical benefit. That’s not to say that the drugs themselves are ineffective or that they don’t do what they were designed to do. It is just that drugs have always been designed around the “average patient,” who doesn’t really exist. In an increasing number of diseases, beginning with cancer and AIDS, we can match specific drug therapies with the patient's genetic makeup. We now can also fine-tune dosages based on metabolism rates, not just the patient’s weight. Are medical practitioners a driving force in advocating change? For most physicians, not yet, for several reasons. First, this is still an emerging field with new discoveries happening on a daily basis. Second, many physicians are skeptical of recent innovations. Their “first do no harm” training favors a trial-and-error approach based on treating for the most likely diagnosis first, and moving on to something else if that doesn’t work. Third, physician education must catch up to the science. Medical school curricula are now beginning to treat genetic analysis as an integral element in a patient’s diagnosis and treatment plan. But it cannot stop there. Since most currently practicing physicians have not been trained in this new field, there is a need to fast-track genetics and genomic learning into continuing medical education and recredentialing programs. Finally, in order to understand the potential for change, it is necessary to look at reimbursement issues. Diagnosis is the critical and time-consuming element in personalized medicine, but with few exceptions, physicians are rewarded for procedures carried out, not for time they spent gathering information and thinking about patient diagnosis. Diagnostic tests account for only 3 percent of health-care spending, but drive 70 percent of all medical costs. The diagnostics industry has been the neglected element of the health-care system. We need to change that. Going forward, we need to view diagnostics, devices, and drugs in terms of the objective value that each creates. What about patient attitudes? Do you think most health-care consumers are ready to place their faith in treatments that require detailed knowledge of their genetic makeup? I believe most patients are more knowledgeable about their own health care than they are given credit for. The popular press has done a good job of covering advances in genetic research, and consumers are trying to integrate that information as they think about health care for themselves and for their loved ones. However, widespread adoption of new medical innovations goes through three phases: Fear, Value, and Acceptance. Patients, physicians, and payers are understandably skeptical at first and fearful about how innovations may change their world. With time and experience, the value of the innovation becomes clear, and acceptance is the eventual outcome. For patients, movement along this timeline requires a high comfort level with the fact that this new data will not be used against them in any way. Will the recent congressional passage of the Genetic Information Nondiscrimination Act alleviate that concern? Yes. GINA protects Americans against discrimination as a result of their genetic information. It’s a critically important step on the path to realizing the promise of personalized medicine. It will take some time before this concern is completely alleviated, but I believe that it will come. If there were a timeline for the transition from trial-and-error medicine to personalized medicine, where are we now? Going back to my previous analogy, we are coming out of the Fear phase and into the Value phase. To go forward, the industry needs to show more evidence establishing the value of personalized medicine tests, and drugs must be available that can successfully treat known patient subsets. Personalized medicine is already established in many areas of infectious disease, especially in AIDS therapy, where every patient’s tumor is genotyped, and the drugs are chosen accordingly. In several areas of oncology, particularly blood cancers, we have also moved close to full acceptance. Is there a role for the FDA to play in bringing personalized medicine more into the mainstream? The FDA is essential to the adoption of personalized medicine. The agency has supported the principles of personalized medicine and is beginning to implement policies to help the movement forward. Several future initiatives are critical. First, the FDA should continue to encourage pharmaceutical companies to embrace personalized medicine by creating a straightforward pathway for approval of a drug or device with an applicable test. Second, the FDA could increase the number of drugs that have specific label requirements for gene-based testing to identify the relevant patient subset or appropriate dosage regimen. Most recently, the FDA changed the label of warfarin, a blood thinning medication, to reflect the availability and efficacy of a test to guide patient dosing. Are there other countries that are making more progress on this than we are? Several single-payer systems have been more aggressive in personalizing medicine and demanding data to drive therapy choice. In some of these systems, however, access to drugs, devices, or treatments is more limited than we enjoy in the United States. Australia’s system is more specific about linking diagnostics to therapies; the country doesn’t just recommend testing, it requires testing. Recent rulings in the UK look at risk sharing and require a drug to prove its efficacy before it is reimbursed. From management’s point of view, we need to weigh the relative perfor-mance of multi-payer, single-payer, and consumer-payer approaches in personalized medicine. We’re obviously in need of big changes in our country’s health-care system, and other countries have lessons to offer. Are you optimistic that health-care reform is imminent? We cannot continue on our present course in health care. The current system will not allow us to remain financially sound and still embrace new and necessary scientific innovations. Both presidential candidates have acknowledged the need for change, and that opens up an opportunity to shift from payment based on activity to payment based on quality and outcome mea-sures. One part of that will be improving the efficacy of drugs and therapies through personalized medicine. What is it like to be a nonscientist working at a research-intensive company like Genzyme? I find myself wishing I had taken a few more science courses when I was in college! I have been extremely fortunate to work with physicians and scientists who understand the importance of a sound business model in achieving the company’s goals. It is a joy to work with a team that brings different disciplines to bear on issues and to be in a place where science and business work so well together. As we move forward in the field of personalized medicine, there will be an even greater need for the integration of people with different skill sets, since the technology and business models need to be developed hand in hand. We have to create systems that combine science, medicine, strategy, and IT in a sophisticated way, and managers will play a large role in meeting that challenge. It’s a fascinating field, and with the potential for saving lives, an especially rewarding one for any leader.